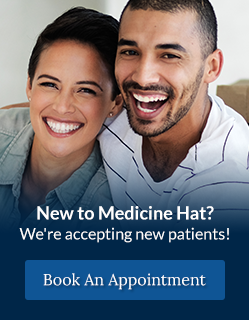 The dentists at River Dental in Medicine Hat, Alberta perform full mouth restorations when a patient has several dental problems that need to be addressed. The dentists at River Dental in Medicine Hat will work with you to develop a comprehensive full mouth restoration treatment plan to help you achieve a healthy smile. If you have multiple dental problems, such as missing teeth, misaligned teeth, worn down teeth, or shifted teeth, our knowledgeable team will devise a full mouth restoration plan to help restore your smile. At River Dental, we'll work together to develop a comprehensive full mouth restoration treatment plan, to achieve a beautiful and functional smile. Once we have a complete understanding of your dental challenges, we will recommend a comprehensive treatment plan that will achieve a beautiful and functional smile.